We endeavor to provide ladies with a plethora of gothic garments, ranging in design and style. 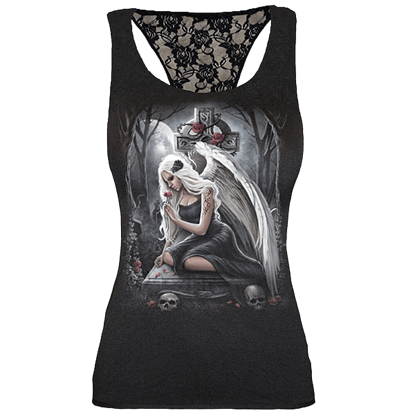 Our selection of womens gothic sleeveless shirts includes racerback tank tops, ruffled camisoles, halter top vests, gothic corset tops, and more. All of our pieces are designed to stand on the cutting edge of gothic style. Choose from gothic formalwear styles with our sleeveless satin blouses and sweetheart camisoles, or go the casual route with printed gothic tops. The graphics on our sleeveless gothic tops show off dark fantasy images like dragons, fallen angels, and wolves, as well as classic gothic icons like skulls, crosses, and roses. 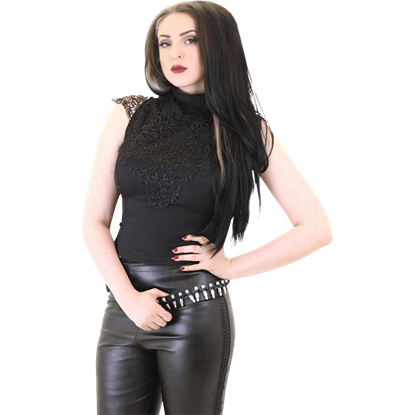 Our two-in-one tops come complete with mesh underlays, providing the perfect gothic style for casual, everyday wear. 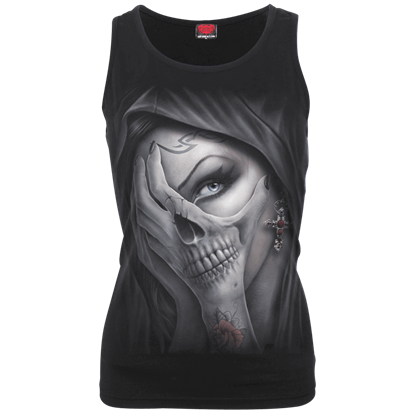 Browse through this category to discover the bold gothic fashions within our variety of womens sleeveless tops. Sometimes, sorrow can even overcome an angel and reduce her to tears. 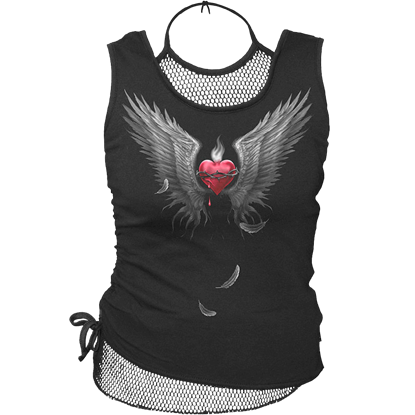 Such an angel is what is depicted on this Angels Cry Womens Lace Tank Top, and while it is somewhat sorrowful and sad, it is also a profoundly beautiful design, as well. Elegant and alluring, the Bella Sleeveless Lace Panel Top is brimming with feminine detail. This sleeveless gothic blouse has ruffled lace trim at each hem and surrounding the panels of black floral lace at the front and back. 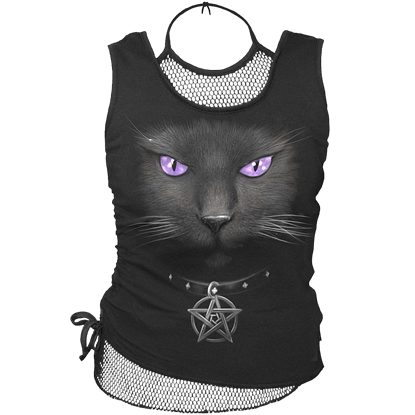 Gothic and bewitching, this Black Cat 2-in-1 Womens Mesh Tank Top is a beautiful garment that combines a witchs best friend with a stylized garment to create something that any contemporary witch would be rather happy to own and wear. Peering eyes gaze through the dead of the night amongst a bed of purple roses on this Black Cat and Purple Rose Lace Top. A striking graphic and beautiful black lace accents make this top a wonderful choice for your Gothic wardrobe! The perfect casual gothic blouse for going out with friends, this asymmetrical top looks great over pants or leggings. 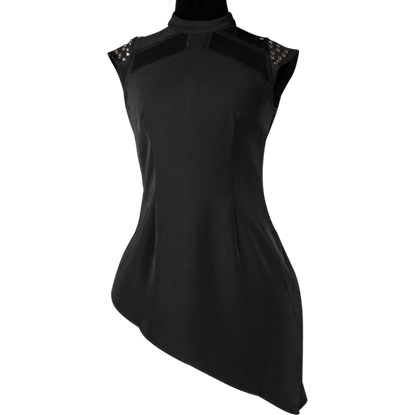 The Black Studded Tunic Blouse displays metallic studs over the shoulders for a touch of punk rock style. It is not a stretch of the word to say that this is the shirt of the broken hearted. 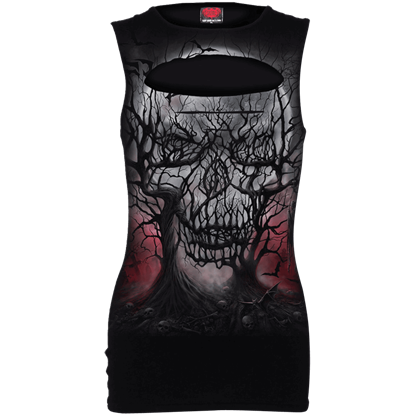 The Broken 2-in-1 Womens Mesh Tank Top is pretty garment that combines gothic design with a stunning 2-in-1 vest design that is perfect for casual wear. 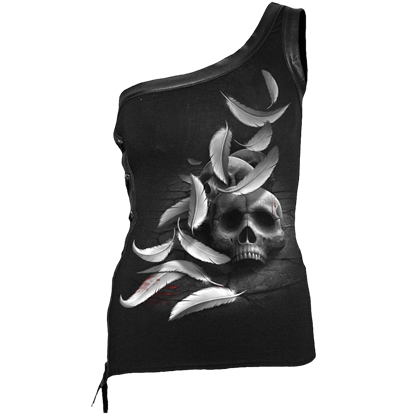 Falling feathers symbolize a broken and fallen angel in this Broken Feathers Off-Shoulder Womens Shirt, and the gothic style is further enhanced by the addition of a bleak skull that watches as the feathers descend from the sky. Do you dare enter the city of angels? This is a place where the good souls go when mortality ends, to become angels in the afterlife. It is that style that makes this City of Angels 2-in-1 Womens Mesh Sleeveless Shirtso entrancing. Do you ever have those moments where food seems to be your best friend? 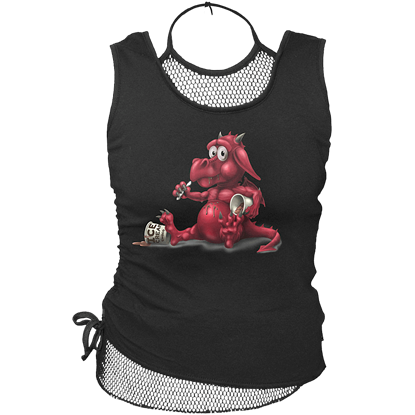 Dragons have those too, and in this Comfort Feeding 2-in-1 Womens Mesh Vest, we see an adorable little dragon that has decided to munch its sorrows away. Paisley has become very popular over the years, and if you want to keep up with modern fashion and styles while maintaining the dark integrity of your gothic wardrobe, then the Daphne Gothic Paisley Top is the right buy for you! 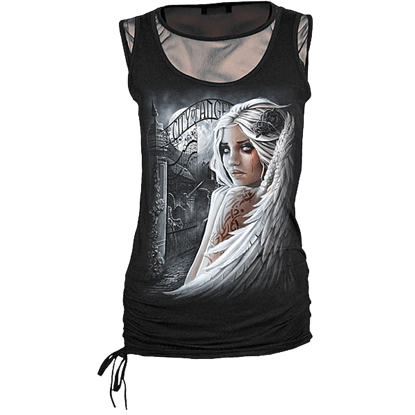 Unleash your inner dark maiden with the Dark Roots Womens Sleeveless Keyhole Top. This fearsome gothic tank top provides a powerful statement by showing off your feminine side with a laser-cut keyhole that sits just beneath the collar. The towns resident sorceress approaches, her beauty and power beyond measure. Little do you know, she has been terribly cursed and is looking for revenge. Behold the truth behind this mysterious maiden with the Dead Hand Racer Back Top.